If you can survive the teething phase, there’s nothing quite as adorable as when your baby cuts their first tooth. But caring for those pearly whites can be a little tricky when you’re starting out, and if you’ve ever read the ingredient list of most commercial brands of toothpaste you’d be wise to exercise some caution when putting these chemicals into the mouths of babes. That’s why I was thrilled to discover Jack N’ Jill organic toothpaste for kids. It’s made in five fruity flavours (oh yay!) and it’s also hypoallergenic and doesn’t contain any mint, sugar, colour, preservatives, or chemicals (big yay!). The fact that it’s also made in Melbourne, Australia, had me rapt! The back story is this: Jack N’ Jill toothpaste is a family company that has been around since 1949, but when it was time for the next generation to take over (just recently), they reformulated it to be 100% safe for young children. Being eco-conscious parents themselves, Justin and his wife Rachel also designed new packaging that is minimal, recyclable and BPA free. Alongside the toothpaste they have designed and manufactured the first children’s toothbrushes that are made of cornstarch, and are therefore biodegradable and recyclable. And did I mention cute? 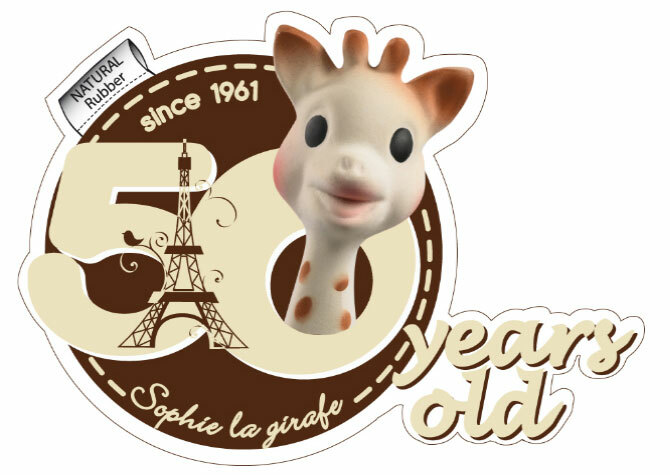 There are four designs – hippo , bunny , koala & dino – and they are also ergonomically designed. For the very little ones, there’s a baby-friendly finger brush made from medical-grade silicone (which is, you guessed it, toxin free) and it has soft bristles on one side and little bumps on the other, to soothe those sensitive gums during teething. The toothpaste is also gentle and safe enough for teething babies. Since my two-year-old is notoriously difficult to wrangle at tooth-brushing time, I decided to give these products a try – and am happy to report that he loves the toothpaste (especially the strawberry flavour) and this twice-a-day ritual is no longer a chore. Jack n’ Jill organic toothpaste and biodegradable toothbrushes are available now at Itty Bitty Greenie. Click here for more on these products. I remember being adamant that my baby would never use a pacifier – thinking they were just one of those devices to make up lazy or poor parenting. If MY baby had all the love and cuddles he needed, there would be no use for a nasty plastic soother … right? Wrong. Two weeks after the birth of my son, and hours of cuddles and rocking and breast feeding and many many tears later (from both me and him), my mother gently suggested that I try a soother. I hated the idea of it, I hated the look of it and absolutely hated that it was called a “dummy” here in Australia, and I resisted further. One more week of sleep deprivation and tears and I gave in. To my surprise, slight disappointment and tremendous relief – it worked. Like magic. But then I had to worry about the dangers of BPA, phthalates and other toxins, as well as keeping it sterilized. Thankfully, I discovered Natursutten pacifiers, made from natural, sustainable rubber (from the tree Hevea brasiliensi), which is environmentally friendly and biodegradable. They are softer than silicone, and extremely hygienic because they are moulded in one piece, so there are no joints or cracks where dirt and bacteria can accumulate. As the name suggests, Natursutten means “natural soother” in Danish, where the company is located. And since they are made from natural rubber, you avoid allergy-causing substances, artificial colours, cancer-causing substances, hormone-disturbing substances, chemical softeners, parabens, BPA, PVC and phthalates. Hooray! For anyone who has seen them before, you’ll recognize Natursutten’s unique colour and shape – which I think looks kind of cute and reminiscent of those old cartoon character drawings of babies … or perhaps even Maggie Simpson? Natursutten soothers come in two styles (round and orthodontic); and three sizes (small 0-6m; medium 6-12m and large 12m+) and are available now at Itty Bitty Greenie. RRP $9.95. When it comes to that time of the month, most of us don’t think twice about what we’re using for “feminine protection” – we’re usually too busy worrying about how to deal with cramps, headaches and if there’s enough chocolate in the house to last the duration. But since all things organic seem to be on my radar these days, I recently came across T.O.M organic tampons and thought they were worth a second look. T.O.Ms are the brainchild of Melbourne entrepreneur Aimee Marks, who, five years ago while studying at RMIT, was designing a new brand of tampons. Through her research, she discovered conventional tampons contain ingredients like rayon, viscose and polypropylene with a cotton string. In simple terms: tree pulp, synthetics and plastics, not to mention the fact that cotton is one of the most highly sprayed crops on the planet. Marks went on to develop a new line of tampons that are better for the environment and for women’s health. T.O.M (time of the month… get it?) tampons are the world’s only Australian Certified Organic tampon brand and a healthy solution for women and the environment. They’re not only toxin-free, but biodegradable too, so unlike other feminine products, they won’t hang around in landfills for generations to come. Itty Bitty Greenie is pleased to be partnering with T.O.M this month and if you join our mailing list you can win a 2-month supply of T.O.Ms certified organic tampons. From plant … to potty … to plant? My son has proudly reached the potty-training stage and I can’t tell you how much I am looking forward to never having to change nappies again. So I’ve been thinking (and reading) a lot lately about ways to approach the whole process, and I started with a trip to a local baby supply store to see what was out there in terms of “potties”. All I can say is that this, like many experiences of buying products for my child, was overwhelming. Is it better to get the seat that goes on top of your toilet? Or the separate potty that sits on the floor? What about the travel potty? And there are ones with Thomas the Tank or Dora the Explorer and every other kids brand you can think of. Should I let my son choose? Why are they all PLASTIC? Can they be recycled? What do you do with it when you’re done? Unlike toys or clothes, a potty is surely not something most people would hand down to someone else – so do all these potties become landfill? There has to be another option, I thought. And it turns out there is. I have found an eco-friendly version of a potty that’s new, and has some pretty nifty features. For one, it’s made from recycled plant materials that biodegrade naturally. Really? Yes. 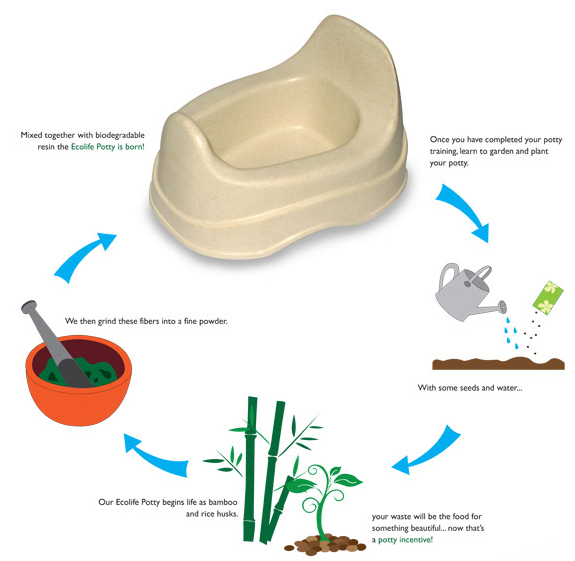 EcoLife International has created a potty made from bamboo and rice husks, that have been ground into a fine powder and then blended with biodegradable resin to form the potty seat, which looks exactly like most standard plastic potties in shape and size. You can use it and clean it in exactly the same way as any plastic potty, and once your child is (finally!) done using it, then it’s time for a little lesson about recycling and gardening that is sure to be rewarding. You can plant the potty in your garden with some seeds and water, and soon it will biodegrade and turn into something beautiful! How’s that for incentive to use the potty? The eco-potty also gets extra points for using minimal packaging – using only a small cardboard sleeve that is made from recycled paper and is also recyclable. And for those worried that the eco potty won’t stand up to repeated washings or exposure to sunlight, there’s no need for concern – EcoLife tests these potties rigorously and they are said to have a life-span of at least a year. (It will only start to biodegrade after it’s been planted in your garden). With a price tag of $19.95 that’s pretty good value. The EcoLife biodegradable potty is now available for the first time in Australia at Itty Bitty Greenie – click here for more details. If you think of the huge transition newborns face when going from the protective environment of the womb to the outside world, skin care is one of those delicate matters every parent should consider. Newborn skin is immediately challenged with exposure to germs, changing temperatures and irritating substances – and those small, developing bodies are less capable of fending off chemical assaults. > The surface area of a child’s skin relative to body weight is greater than adults, and infant skin is considerably thinner than adult skin. That means anything that is absorbed by the skin of a baby is a lot more potent. After a review of 23 studies of early life exposures to cancer-causing chemicals, the U.S. Environmental Protection Agency concluded that carcinogens are typically 10 times more potent for babies than for adults, and some chemicals are up to 65 times more powerful. > A child’s developing organ systems are more vulnerable to damage from chemical exposures, and children are less able than adults to detoxify and excrete chemicals. > Children have more years of life in which to develop disease triggered by early exposure to chemicals, and research suggests exposures to industrial chemicals may prime children for adult disease, just as a few severe sunburns during childhood doubles the likelihood of developing malignant melanoma later in life. > There are more than 10,000 ingredients being used in the skin care industry, and 89% of these have not been tested for toxic or carcinogenic chemicals. Awareness of chemicals in skincare is certainly increasing and more parents are trying to choose wisely, but in the meantime the number of so-called “natural” products on store shelves has multiplied dramatically. These days, buying baby’s bathtime bubbles isn’t so straightforward, but here are a couple of ways to keep it simple. First, read labels carefully. Just because a product claims to have “natural” ingredients doesn’t mean ALL of its contents are derived from organic sources or are paraben and phthalate free. Knowing how to decipher ingredients can be a bit tricky, but some key toxic ingredients to look out for are: parabens, phthalates, sodium lauryl sulphate (SLS), petroleum derivatives, diethanalomine (DEA), mineral oil, artificial fragrances and colours. For a more comprehensive list of ingredients and their potentially toxic affects, read Skin Deep’s safety guide to children’s personal care products, which identifies 20 common ingredients of concern. The Skin Deep website also has a good database if you want to look up the safety rating for baby products. Second, bear in mind that whatever you put ON your child’s skin, is also going IN. Most people use far more product than is necessary and children don’t need to be slathered in suds, lotions and powders. A little warm water and mild cleanser at bathtime, then a small amount of moisturizer (or spot treating) does the trick. Not only are these products super cute and organic, the packaging is completely biodegradable (pictured right). I LOVE supporting companies that embrace a green ethos in everything they do. To purchase items from the Taslie skin care range, please click here to visit Itty Bitty Greenie’s retail site. This Australian brand of certified organic skincare (pictured above) was developed by a health care and aromatherapy specialist. I love the the sweet orange, lavender and spearmint combination in the body wash – it’s so refreshing. The gentle vapour rub balm is also a must-have, to soothe any congestion from cold & flu. Check out the entire range here. Buds was formulated in Australia, and uses unique organic ingredients sourced from 100% organic farms all over the world. The formulas are preservative-free and certified by ECOCERT, one of the world’s most highly regarded certifying boards. Visit Itty Bitty Greenie’s retail site for more details on the Buds range of skincare.